Somebody has dug up a photo from the Apollo 17 mission that appears to show a man reflected in a visor, but skeptics disagree. Moon landing conspiracy theorists say they’ve found the smoking gun proving that our lunar arrivals in the 1960s and 1970s were filmed in a studio, but the photo they’re trumpeting is unlikely to convince the skeptics. 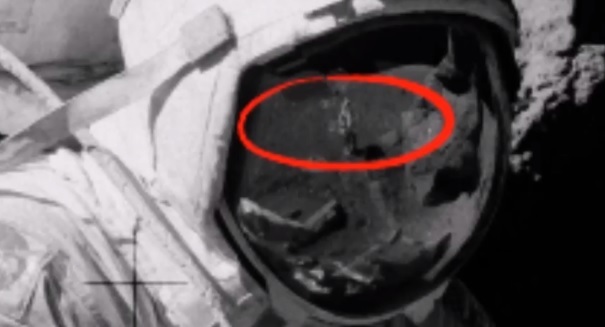 A YouTube user has posted a photo taken during the Apollo 17 mission, the sixth and last mission to the moon, and he claims that it shows a man without a spacesuit reflected in an astronaut’s visor. Many other conspiracy theorists commented in agreement, saying that this was now proof that the U.S. government faked the moon landing in order to declare victory over Russia in the space race. However, others disagree, arguing that the blurry, low-resolution picture in the visor could easily be an astronaut who was indeed wearing a space suit, or perhaps just a rock formation. A remarkably large portion of the population believe theories that the moon landing was faked, which is one of the most popular conspiracy theories in the world, with polls show between 9 and 20 percent had some doubts about the landing. The doubts are higher in Russia, where one 2000 poll showed the 28 percent don’t believe the story.